A patent assignment is being able to legally transfer an owner’s property rights that are under a certain patent or certain patents, and any applications for said patent. Once the transfer is deemed as successful, this means that the assignee will now receive all of the owner’s interest and will now have the exclusive rights to the intellectual properties. If you are looking for quick information about patent assignment, we are here for you! We also have a couple of sample patent assignments that can help you have a better insight as to what you need to fill out when it comes to applying for patent assignments. Once you are ready to find out more, just make sure that you keep scrolling! You may also see assignment letters. Patent Issued or patents that are considered to be already issued. You may also see assignment of mortgage templates. Patent Application or patents that are still in the application process. No Patent Issued or inventions that are yet to be registered without any patent. The power that is granted to an assignee in order to prevent others or try to prevent others from distributing or selling inventions with patents without any permission from the patent owner. You may also check out assignment of lease templates. Assignees do not make the inventions on their own. Plus, going through the whole patent application process can be such a lengthy one. They just really want to assume the exclusive rights to the intellectual property. So what is the biggest advantage that assignees get from a patent assignment? The potential profit that they will get. You may also see assignment of contract templates. Intellectual property owners earn from their intellectual property as a ton of patents allow owners to earn from their inventions. Once the patent has been transferred, the assignee can start earning a portion of the profits from the patent. This means that both the patent owner and the assignee will benefit from this arrangement. You may also like assignment schedule samples and templates. There are too many inventors or the opposite. Patents can have more than one owner of the product or design made. There are times where a patent may have too many owners or too little owners. Should this be the case, incorrect filing may be argued and this can actually make the assignment of the patent not possible at all. You may also check out assignment sheet templates. Limited recourse. Some older patents may have already been under a couple of infringements. There are a limited number of patent assignments that may sue for any infringements that were encountered in the past or it is also known as the right to causes of action. This can actually cost the person assigned to the intellectual property potential profit, which can be a big loss. You might be interested in deed of assignment samples. You can find out more about patent assignment by reading up on Assignment of Intellectual Property Rights. The very first thing that you should do would be to fill out a form that is specific for patent assignment. This usually called a Patent Assignment Recordation Coversheet. 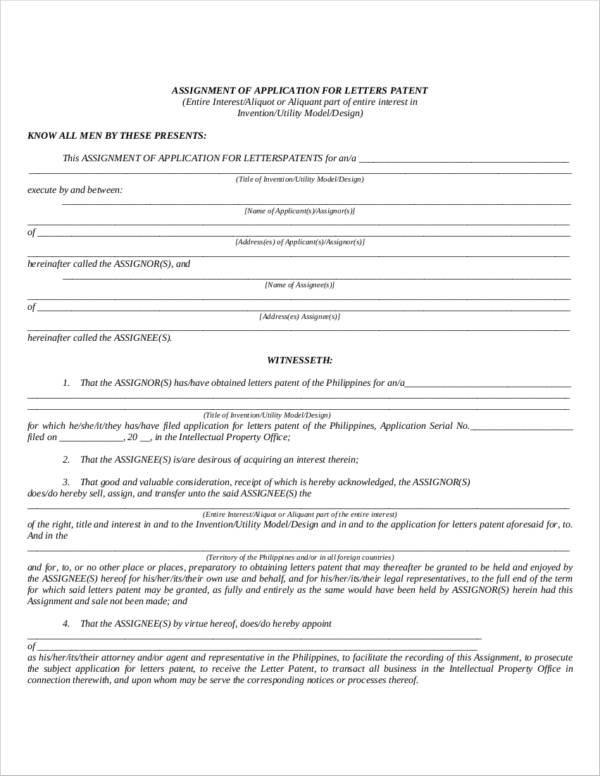 This form can usually be found online. 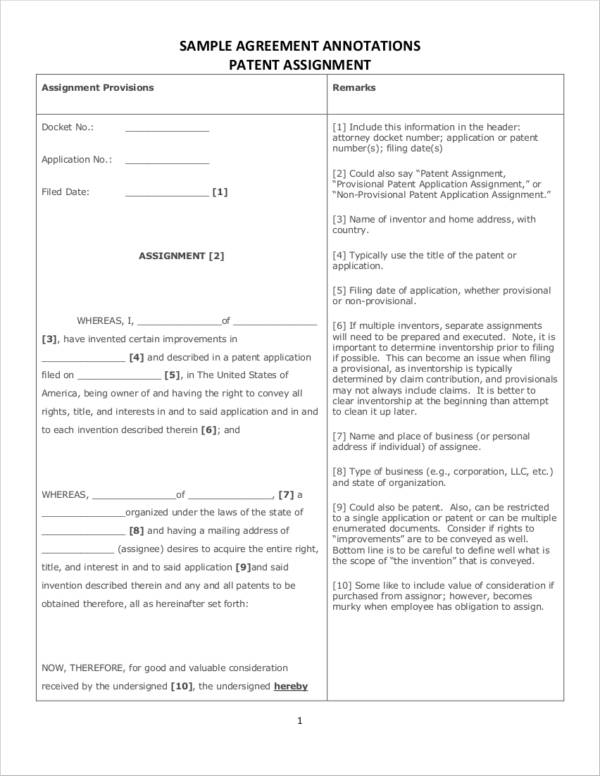 Should it not be available in your location, you may check out Patent Assignment Forms that we have right here to ensure that you have your own patent assignment form. However, to ensure that you have everything covered, you may want to have an attorney check out the form. How Long Will Patent Assignment Applications Take? Getting a patent is not going to be an easy process as it can be a lengthy one. According to the USPTO, patents can take up to three years before they get approved. The fastest means of making money from your invention can be through selling the patent for the invention that you have made and applying for the assignment. This way, you can easily see returns from the creation that you made. You may also see legal letter format samples. You have to take note though that even if you will assign the patent to an assignee, it does not guarantee that you will get the patent in a faster manner. However, it will help to protect you and the assignee regarding the ownership and the rights of the invention. Patents will help to make you receive a lump sum price during the time the assignment was filed instead of collecting royalties from the invention. You may also like sample legal forms. Once the invention or creation has been already patented, you are sure that you and the assignee will benefit from the patent and that it belongs to you and the assignee alone. More information about buying and selling of intellectual property by checking out the article we have about Guide for Buying and Selling Intellectual Property. 1. Failing to file the assignment document. Do not rely on verbal agreements alone. Filing the transfer or assignment of the patent will help to leave a good paper trail regarding the patent assignment. Aside from the forms in this article, you may also check out Sample Assignment Letter if you want to make use of letters. 2. Actions before successful assignment. The assignee should make sure that he/she should not sell the invention even before the patent has been successfully assigned to the assignee. This can lead to patent infringement. 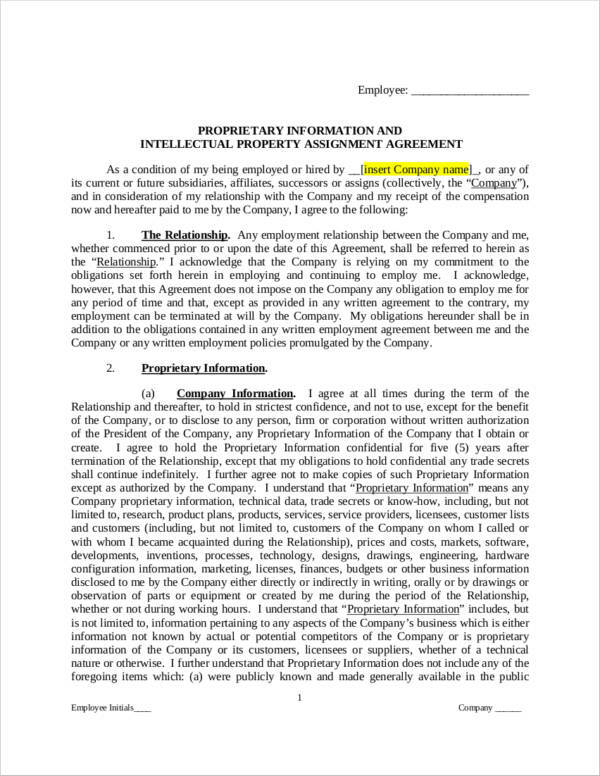 Patent assignments are considered to be legal and official documents. So you want to make sure that everything has been carefully reviewed before the submission of all the requirements. Make sure that the name of the assignee has been spelled out right. You should also make sure that all the owners of the patent are listed down in the patent assignment. You may also see what constitutes a legal contract? 4. Failure to properly identify the patent. 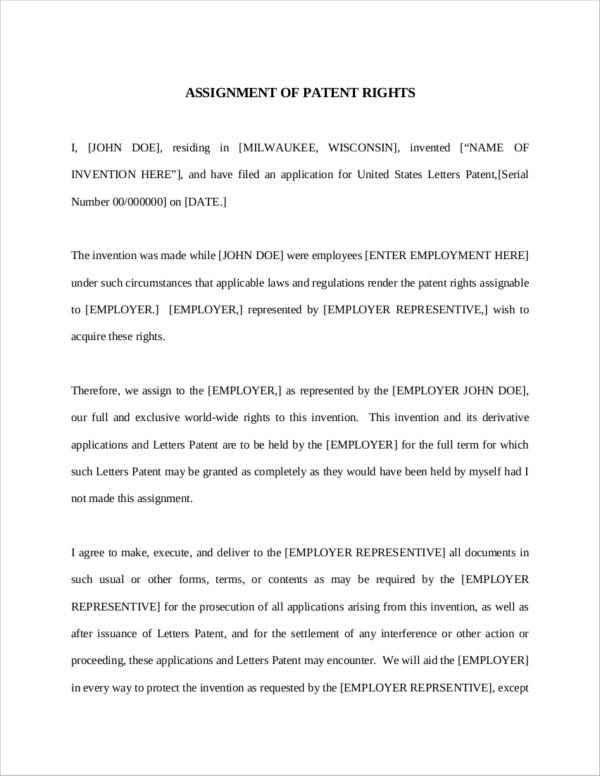 You want to make sure that all the information about your patent should be included in the patent assignment document. The patent number and all of the patent information should be included in the application forms or application letters. 5. Failure to check security interests. You want to make sure that you are able to check for any security interests that might be present as patents can actually be used as collateral. 6. Failure to getting the application notarized. You want to make sure that all the documents that you will be submitting for the patent assignment have been duly notarized by a notary public. It gives your patent assignment a huge advantage regarding the legality of the transaction. If you cannot get your documents notarized, make sure to have at least two witnesses to sign your documents. You may also like legal memo format samples. 1. 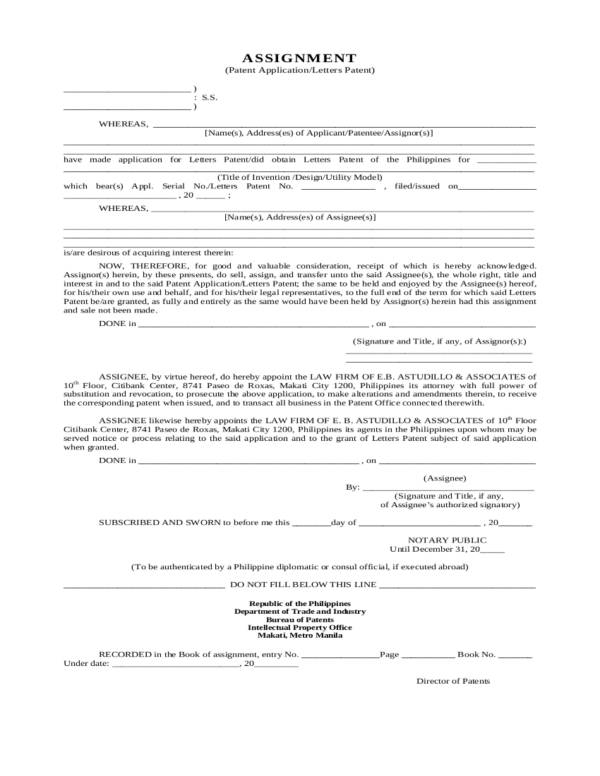 Fill out an application form for the patent assignment. 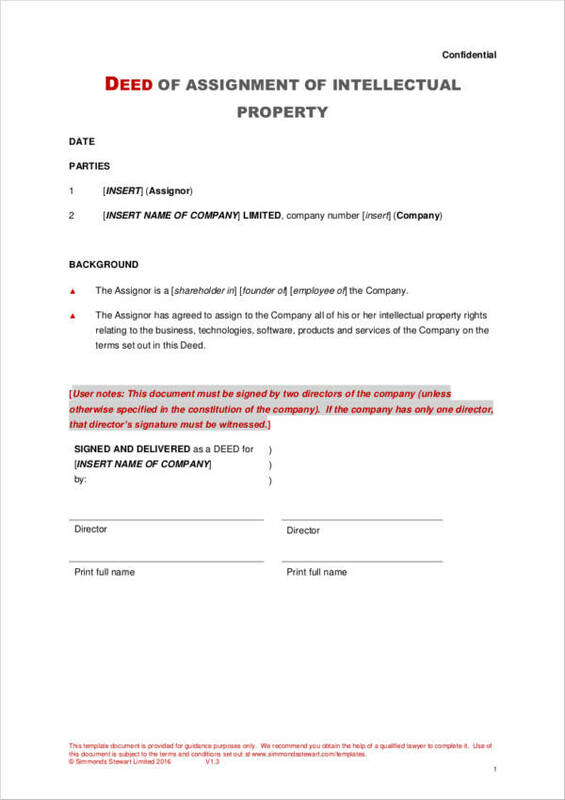 This is where you will state the name of the owner(s) and the name of the assignee(s). You will also be asked to state the patent number and the patent title. 2. 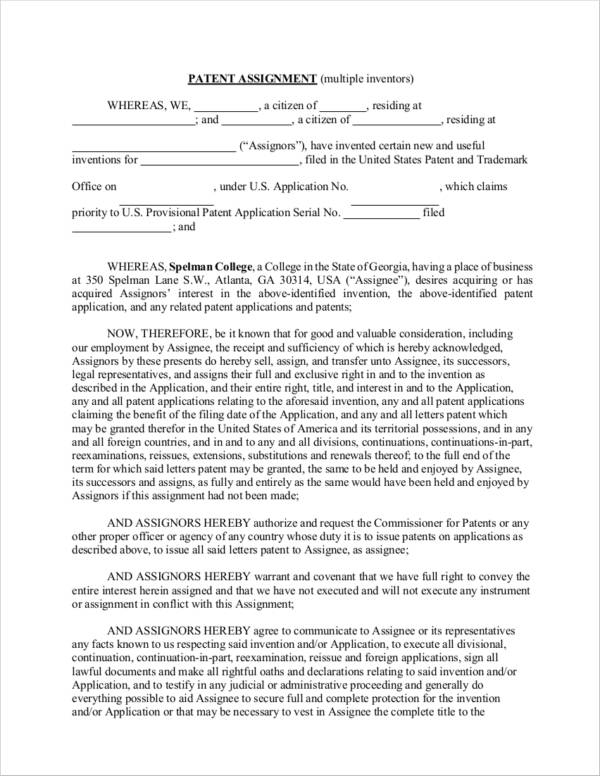 Secure a patent assignment agreement. 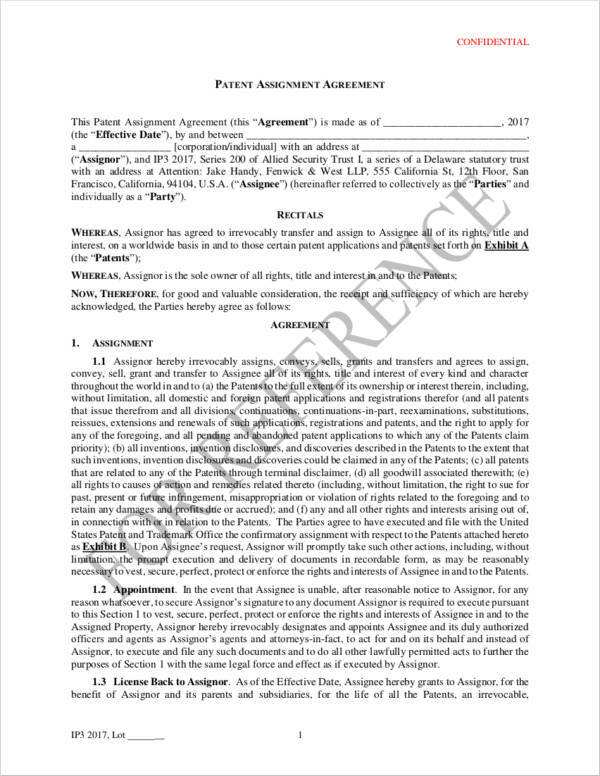 This document will state that the owner will be assigning the patent to the assignee. The intellectual property should also be properly described in this document. Provisions, as well as the terms and conditions, should be stated in this document with regards to the transaction. 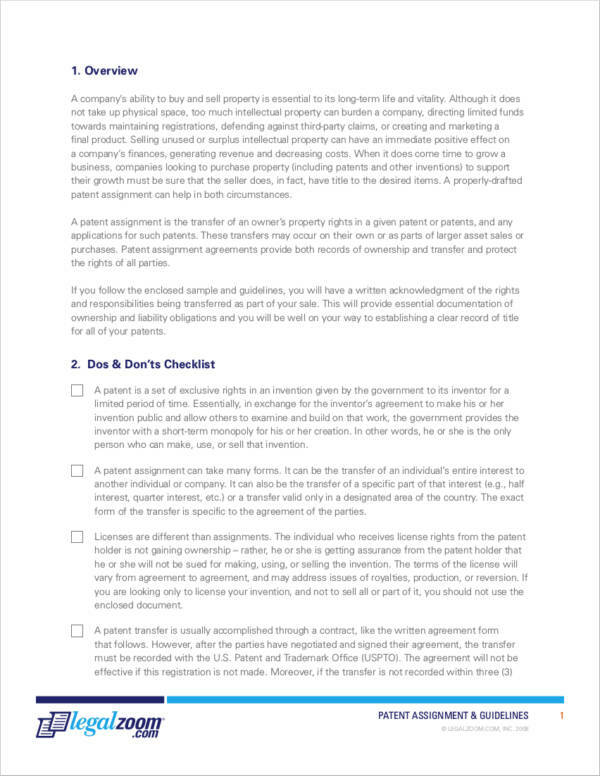 Check out Free Sample Agreements for more information about how you can come up with your very own agreement and the boilerplate that you should include in your agreement. Do not forget to have the owner(s) and assignee(s) sign the agreement to indicate that all parties involved agree to what is stipulated in the agreement. Take note that even if you are assigning the patent to a family member or a close friend, having a patent agreement will help to ensure that you and the assignee will be protected from a breach. In case you experience a breach, you may take a look at our article on Remedies for Contract Breaches to have a good idea on what you can do. 3. Submit the general application form and the other requirements that you might be asked to provide to ensure the success of patent assignment. There you go! Now you have a better idea about how you can assign your patent to someone else. Do not hesitate to ask for help from someone who has experience with patent assignments or from attorneys to ensure that you’ve got everything covered. You may also check out legal invoice template.